The TheraMind® Center of Los Angeles provides state-of-the-art outpatient psychiatric and psychological treatment services including Transcranial Magnetic Stimulation (TMS) therapy and conducts clinical research trials. The Center is located in a modern, high-rise office building on Wilshire Boulevard in Los Angeles with convenient parking in the rear of the building and easy handicap access. The Center features rooms for TMS therapy treatments, examination and consulting rooms, a conference room, and offices for our health professionals. Our medical professionals at the Center have successfully treated patients suffering from Major Depressive Disorder (MDD), Anxiety Disorder, ADHD, Obsessive Compulsive Disorder and other mood disorders. In addition to offering TMS Therapy, our Center works with prescribing physicians to design a treatment program tailored to the individual needs of each patient. Under the supervision of our physicians, our TMS Specialists provide a safe, non-invasive and effective outpatient procedure that has helped thousands of patients who have not responded well to drug therapy. The TheraMind® Center of Los Angeles is under the Medical Direction of Dr. Alexander Bystritsky and Dr. Tanya Vapnik and supports patients who live or work in Los Angeles and particularly the West LA area. Dr. Bystritsky is one of the leading experts in anxiety disorder medicine in the United States. Dr. Bystritsky is a distinguished graduate of and received his medical degree from the Pavlov Medical University, St. Petersburg, Russia. He also received his Ph.D. equivalent in Psychopharmacology from the Pavlov Medical University. Dr. Bystritsky is Board Certified by the American Board of Psychiatry and Neurology and is licensed to practice medicine in both California and New York. He is a member of the American Psychiatric Association, the Southern California Psychiatric Association, the Anxiety Disorders Association of America, the Russian-American Medical Society, the West Coast College of Biological Psychiatry, the American Medical Association, the California Alliance for Mentally Ill and the OCD Foundation. Dr. Bystritsky currently serves as the Professor of Psychiatry and Biobehavioral Sciences at the UCLA School of Medicine and acts a consultant to California Advanced Neurotherapeutics, Inc., Healthcare Partners Medical Group, Los Angeles, California. He also serves as a Director of three programs at the UCLA Neuropsychiatric Institute & Hospital in Los Angeles: Treatment Resistant Anxiety Disorder and OCD; Outpatient Psychopharmacology; and, Anxiety Disorders. Dr. Vapnik is received her Doctorate in Clinical Psychology from the California Graduate Institute in Los Angeles, California. She is also a registered nurse and received her degree in nursing from the Fourth Medical School, Leningrad, Russia. In addition, Dr. Vapnik has a Masters of Science degree in Electrical Engineering from the Kalinin Polytechnical Institute, Leningrad, Russia. Dr. Vapnik is Certified as a Transcranial Magnetic Stimulation Therapist. She has also been certified by MedAvante in administration of various psychiatric assessments: PANSS, HAM-A, HAMD 17, MADRS, CGI-I, CGI-S, C-SSRS, Y-BOCS and MINI. She is a member of the Obsessive-Compulsive Foundation and of the Anxiety and Depression Disorders Association of America. Dr. Vapnik is a Staff Psychologist at the Semel Institute for Neuroscience and Human Behavior at the She serves as an attending supervisor in the Anxiety Disorders Clinic, University of California, Los Angeles. She is also an Investigator with the CalNeuro Research Group and the Pacific Institute of Medical Research both in Los Angeles, California. 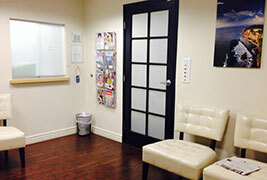 Since 2001, Dr. Vapnik has also owned and operated a CBT Associates, a private practice, in Los Angeles. LA’s new TheraMind® Center — Setting the standard for Integrated, Multi-disciplinary Neuropsychiatric Healthcare! For an appointment or to learn more about our services, call (805) 845-4455.